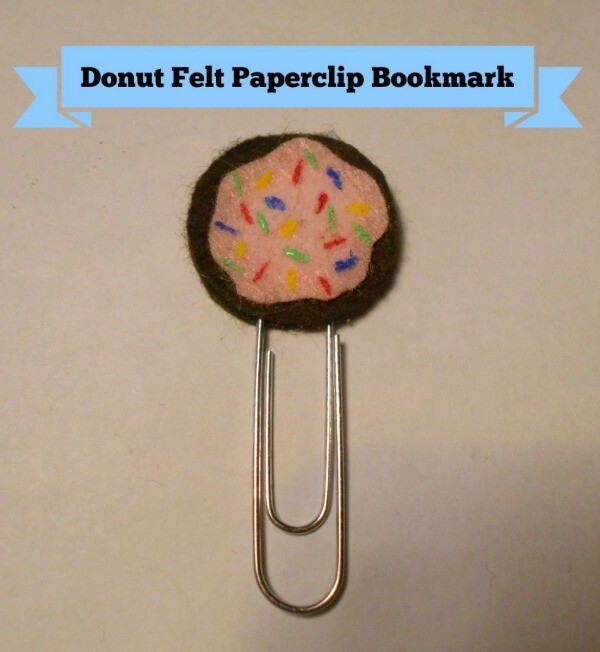 This cute little felt donut shaped bookmark is easy to make. It is the perfect gift for the reader in your house. 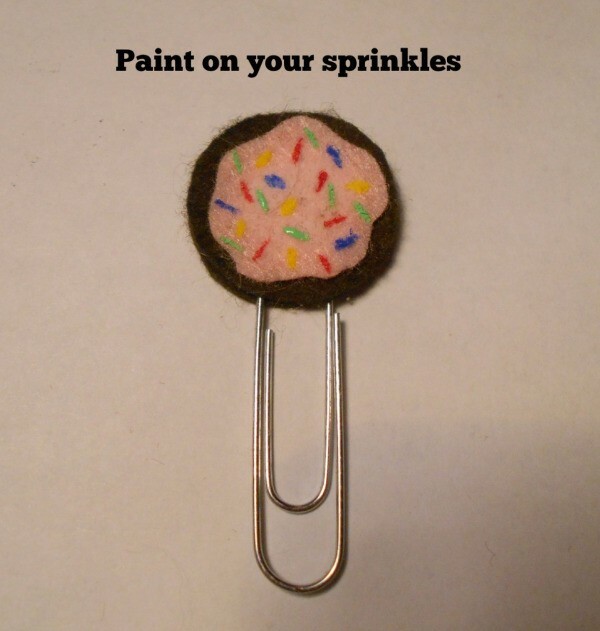 This is a guide about donut felt paperclip bookmark. This adorable felt bookmark will not only help you keep your place, but is so cute everybody will want their own. And they are so easy to make you could make a dozen donuts (booksmarks that is) easily! fabric paint and a small paint brush. Trace a circle onto your donut felt, in this case the dark brown. I found that my Ulta nail polish bottle was the perfect size for my paperclips. Repeat this a second time so you have two circles. Cut the two circles out and double check that they match. You don't want to discover they don't line up after you've already glued then into place. 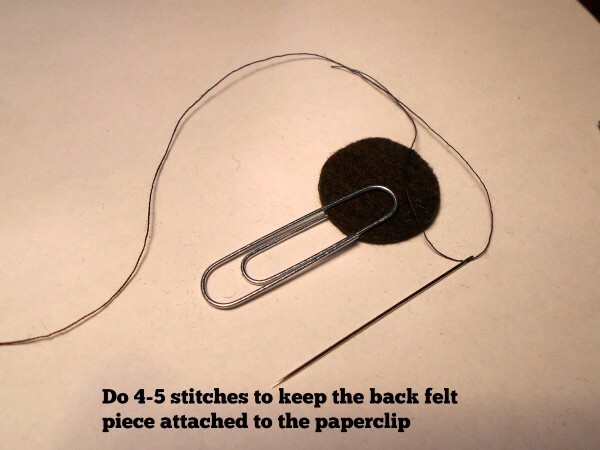 To prevent the paperclip from detaching from the felt during repeated use, do a few stitches to keep it in place. 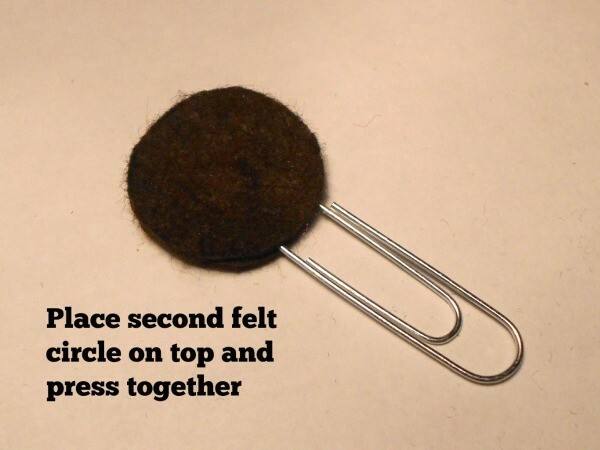 Place them at the very top of the paperclip, making sure to tie it off well. 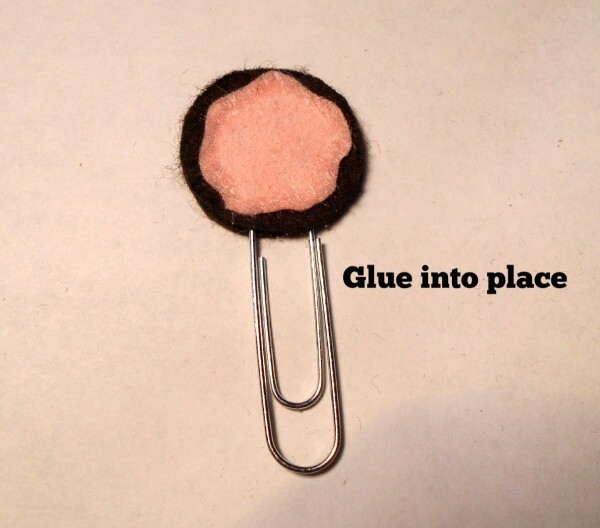 Now that the paperclip is secured in place, apply a generous layer of your glue of choice. 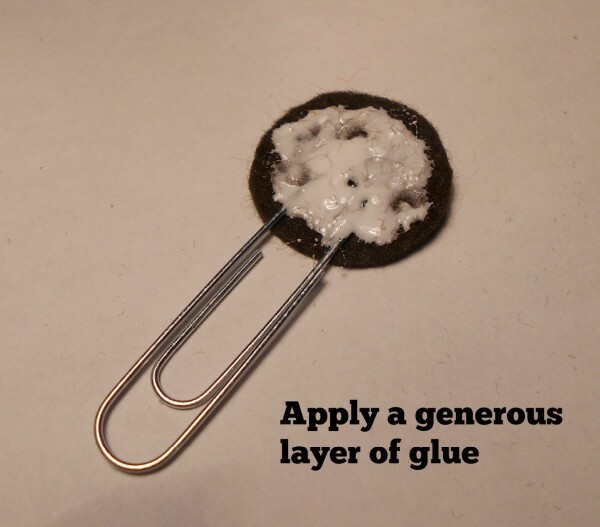 Make sure the glue goes to the edges so it doesn't eventually split apart. 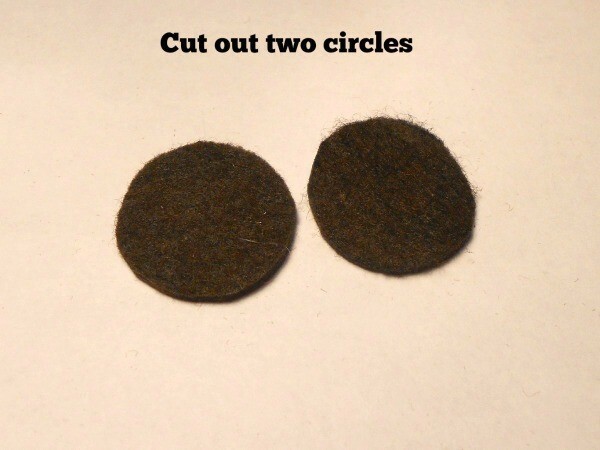 Place the second circle of felt onto the glued side and press them together. 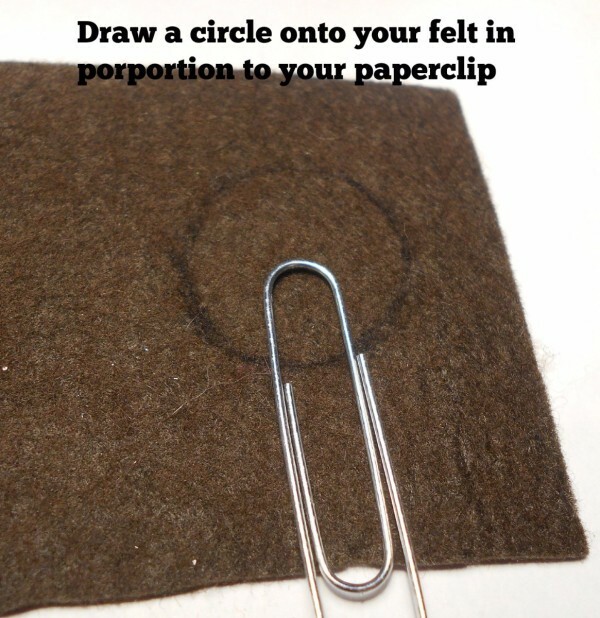 The paperclip should now be sandwiched between the two pieces of felt. I think it kind of looks like an Oreo at this point. Cut out a blobbly shaped circle smaller than your donut circles out of your frosting color, in this case my light pink. You want it small enough that you can see the donut color all around it. Apply a layer of glue to the icing piece and press it onto your donut piece. 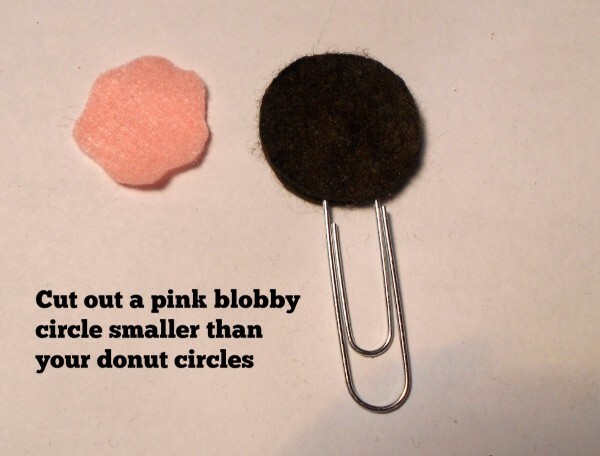 It should now start to look like an actual donut. Let the glue dry for a while before you move onto the next step. 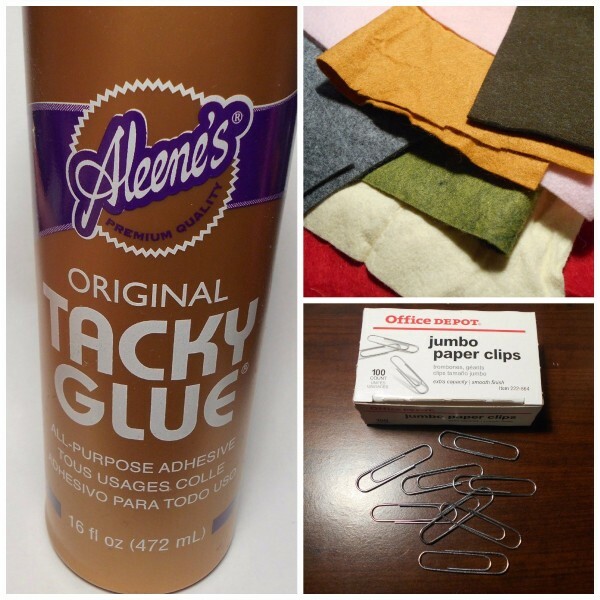 Using a few different colors of your fabric paint, paint on short little dashes. 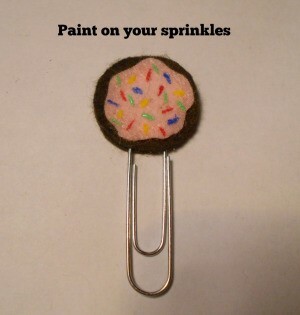 These are your sprinkles. I used blue, red, yellow, and green so my donut would match one of my favorite types. Let everything dry completely (I recommend overnight) and your bookmark is all ready to go! I'll be using mine in my planner to mark some important dates for work I need to keep track of. What about some colored bugle beads? Instead of paint? Or tine round ones for sprinkles!